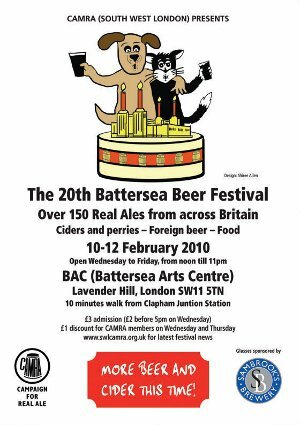 If you are new to the South West London CAMRA Battersea Beer Festival you will find that Battersea Arts Centres proximity to Clapham Junction makes the venue easily accessible by public transport. 77, 87, 156, 345 and G1 stop on Lavender Hill outside BAC as do the night buses N77 and N345. Routes 35, 37, 39, 49, 170, 219, 239, 295, 319, 337, 344, and C3 buses either terminate at, or go through Clapham Junction. BAC is then a 5/10 minute walk up Lavender Hill on the left hand side. The night buses N19, N31, N35 and N37 also stop near Clapham Junction. BAC is a 15 - 20 minute journey from either Waterloo or Victoria station. Take the train to Clapham Junction, pass through the shopping centre exit and turn left out of the station. BAC is a 5/10 minute stroll. Walk up Lavender Hill past ASDA, the Post Office and Magistrate Courts and cross Latchmere Road. BAC is at the top on the left hand side.